Liberia-flagged oil/chemicals tanker Alia caught fire in the North Sea off Denmark following an explosion in its engine room on October 20, while the 2003-built tanker was carrying fuel oil from Malta to Gothenburg, Sweden. The crew of the 35,669 dwt tanker called the Danish rescue and support vessel operator Esvagt to assist in putting out the fire. The 183-meter Alia was 64 nautical miles west of Hvide Sande at the time of the accident. Esvagt deployed two special service/standby rescue vessels - Esvagt Gama and Esvagt Omega - to assist the disabled tanker and help cool down the vessel's hull, so the crew could enter the engine room and tackle the flames from within. 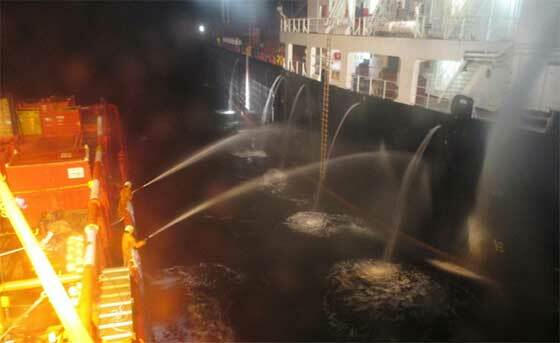 The two vessels sprayed water on the tanker's hull for about three hours, after which the crew onboard the tanker was able to enter the engine room. The vessel is reportedly still adrift in the North Sea, and will need a tow to a nearest port. There have been no injuries to the crew, nor any oil spills reported thus far. The Alia is managed by the Hamburg-based Tb Marine Shipmanagement.